I’ve struggled with my oven in Israel. It’s electric, it’s in Celsius, but more than anything it’s uneven. A cake comes out perfectly cooked on the outside, and completely raw in the middle. I can produce good banana bread, and I’ve even managed to pump out a decent cake, but for the most part my oven is unreliable. So I’ve been trying to expand my dessert repertoire beyond baked goods. 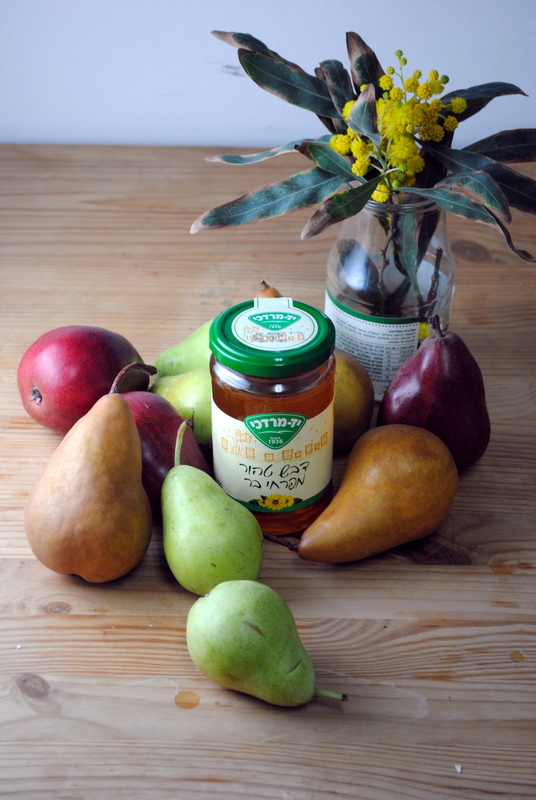 Enter poached pears. This incredibly simple stovetop dessert is elegant, refined, and in no way relies on my oven. And it’s my favorite kind of dish for entertaining: one that not only can be made ahead, but must be made ahead. Pears are quartered, poached until tender, and then chilled in their poaching liquid for at east two hours or overnight. 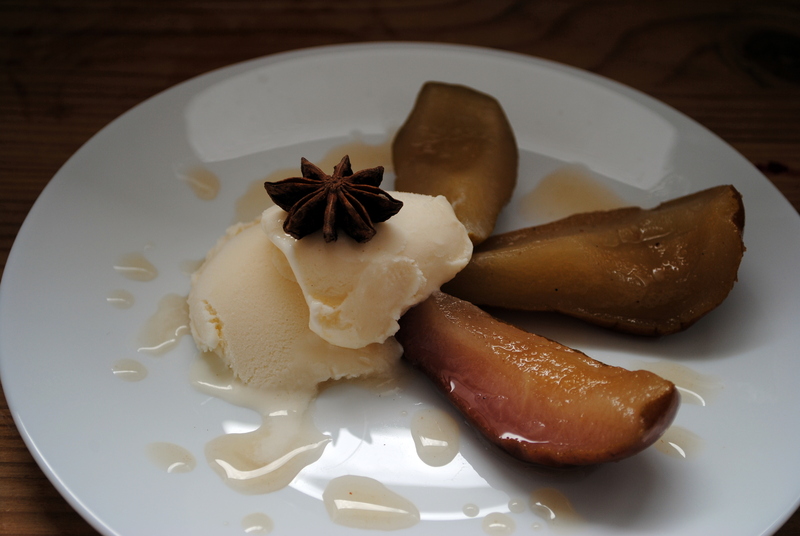 I have made poached pears before, but none came out as beautiful as this. The recipe, from an article in Bon Appetit all about honey, called for poaching the pears in a heady mixture of water, honey, and star anise. The process and result are both so simple, but absolutely beautiful in their simplicity. The slightly spiced flavor, the exotic notes of star anise, the sweet, highly grown-up syrup – all combine to create a graceful dessert, the perfect end to a dinner party. While I typically associate poached pears with fall, these are fit for any time of year when pears are available. I used a mixture of three types because they all looked so good, but any variety will work here. Depending on how much you boil down the poaching liquid afterwards, you may still have a lot leftover. Save it in a glass jar in the refrigerator for up to a week (probably longer) and drizzle it on ice cream or try mixing it into a cocktail. Honestly, I’m sure there are a million applications and a million ways to avoid wasting this beautiful nectar. Vanilla ice cream, lightly sweetened fresh whipped cream, or crème fraiche are the ideal accompaniment to the poached pears. Chocolate ice cream is surprisingly good as well, and appeases the chocolate lovers. To keep the dessert parve and/or vegan, go with a soy-based ice cream (preferably a good soy ice cream rather than those icing-flavored parve ones). Combine 2½ cups water, honey, star anise, lemon juice, and sea salt in large saucepan. Bring to boil over medium heat, stirring occasionally. Add pears; reduce heat and simmer until tender, turning occasionally, 4 to 6 minutes, depending on ripeness. Using slotted spoon, transfer pears to medium bowl. Boil liquid and star anise until reduced to 1 cup syrup, about 22 minutes. 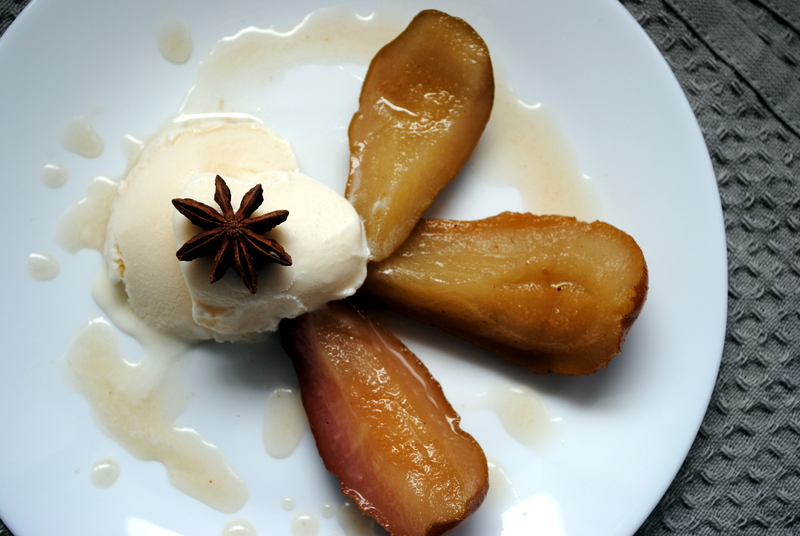 Pour syrup with star anise over pears. Cover and chill until cold, about 2 hours. Can be made 1 day ahead. Keep chilled. Remove star anise from syrup. Divide pears and syrup among bowls. Top each with dollop of crème fraîche or ice cream and serve. These do look super elegant, and I LOVE the use of star anise. That’s an herb that I really like but don’t have enough ways to use. Will have to try this soon. Thanks for sharing! Thanks so much Rivki! The star anise definitely makes the dish. I also don’t use it nearly enough! I would never garnish anything with something I could not eat. I love the licorice taste of anise in many things, especially breads, but only the seed is actually edible. Powdering the whole star anise is another way to get the flavor and brown color as a garnish. Tyler, you make a good point about the garnish, but I think star anise looks so pretty. And it is used to flavor the dish. Thanks for your comment, and your suggestion of powdering the star anise. You’re welcome, I’m glad you did not take offense to that. You have tough skin and great cooking skills and I totally agree on how naturally beautiful the star anise is. I also enjoyed your recipe, good stuff.